Orihime (織姫, Weaving Princess) the daughter of the Tentei (天帝 The King of universe) wove beautiful clothes by the bank of the Milky Way (天の川 Amanogawa). Her father loved the cloth that she wove and so she worked very hard every day to weave it. However, she was sad that because of her hard work she could never meet and fall in love with anyone. Concerned about his daughter, Tenkou arranged for her to meet Hikoboshi (彦星 Cow Herd Star) sometimes called Kengyuu (牽牛) who lived and worked on the other side of the Amanogawa River. When the two met, they fell instantly in love with each other and were shortly married. However, once married, Orihime no longer would weave cloth for Tenkou and Hikoboshi allowed his cows to stray all over Heaven. 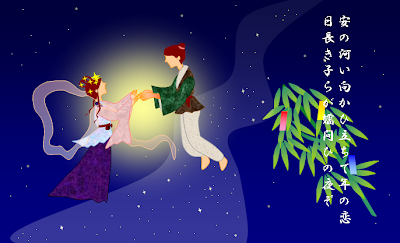 In anger, Tenkou separated the two lovers across the Amanogawa River and forbade them to meet. Orihime became despondent at the loss of her husband and asked her father to let them meet again. Tenkou was moved by his daughter’s tears and allowed the two to meet on the 7th day of the 7th month if Orihime worked hard and finished her weaving. The first time they tried to meet, however, they found that they could not cross the river because there was no bridge. Orihime cried so much that a flock of magpies came and promised to make a bridge with their wings so that she could cross the river. If it rains, the magpies cannot come and the two lovers must wait till next year. Take a pen now and write your wishes on anything available - pen, leave, bamboo. By the midnight, burn it or float it on the river, and may your wish come true.